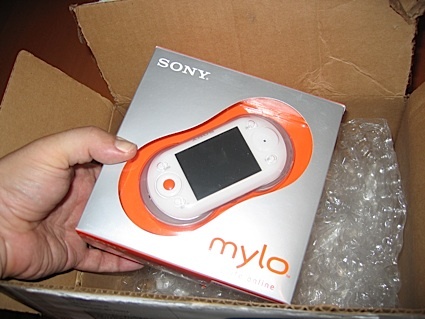 Holy hot damn, we got us a Mylo up in this piece. 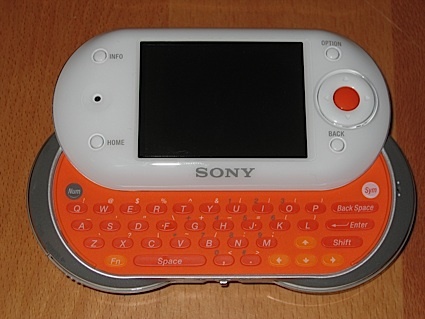 Yes, unfortunately it's only a late prototype (we haven't actually heard of anyone getting a final production unit yet) but here she is, Sony's ever-hopeful ace in the hole to get a foothold in the pockets of disenfranchised Sidekick 'tweens everywhere (and maybe even some 770 user throwbacks as well). Click on for the full report. They had to get 'er out the door fast, we were calling by the hour. 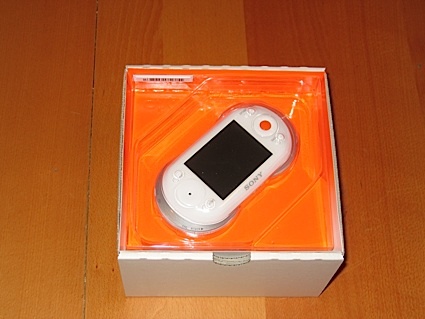 The box matches the orange-and-white color scheme nicely. 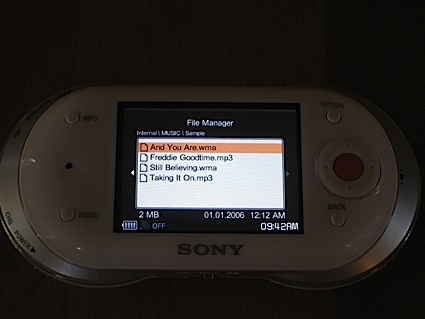 Touring around it, we can see some pictorial feature highlights, support for Google Talk, Yahoo IM, and Skype (with voice, of course), and some of the media formats supported, including WMA and -- whew -- ATRAC! That was a close one. Note the "No 911" service warning. 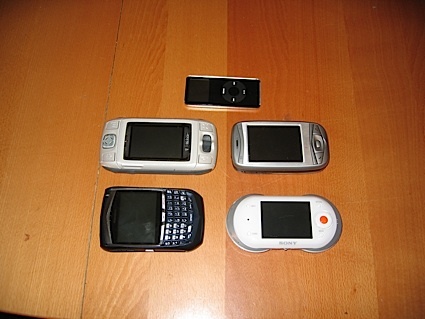 Darn, and we were hoping to give up our cell phones for Mylo. 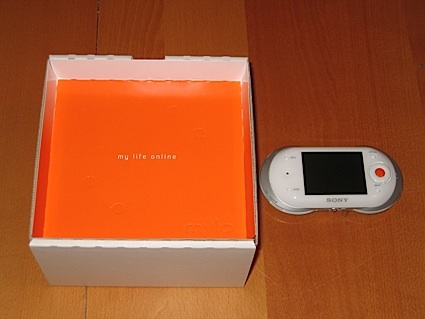 aThe top part of the box has the Mylo's tag line, "My life online," that is, as long as you live your life within range of a Wi-Fi access point. 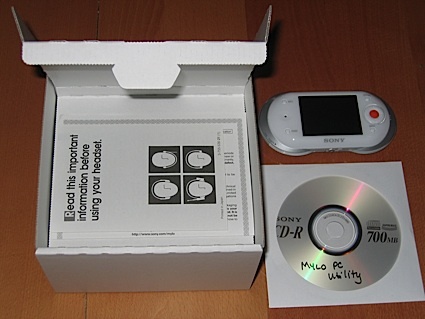 Digging deeper, we have the "important information" pamphlet and the PC software. 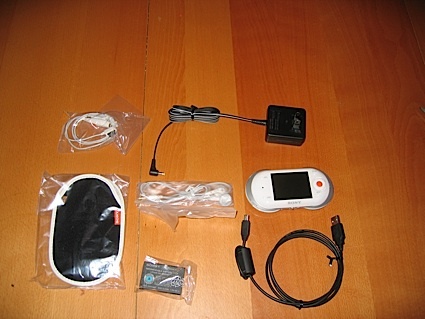 USB cable, AC adapter, slip case, battery and earbuds. 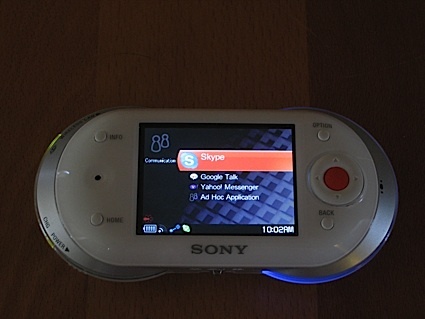 The Mylo can also charge via USB and enter mass storage mode There's also a microphone for help get your Skype on. The Mylo can also be used as a Skype WiFi handset, just hold it up to your right ear and the built-in micophone and speaker do their thing. 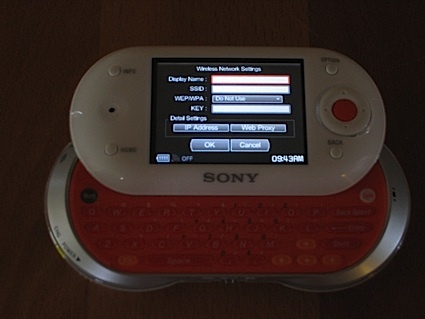 Here's a closeup of the slide-up keyboard. The oblong keys take a little getting used to. They're raised ever so slightly above the surface and are unfortunately not backlit. Darker orange on orange doesn't make for great contrast, either. 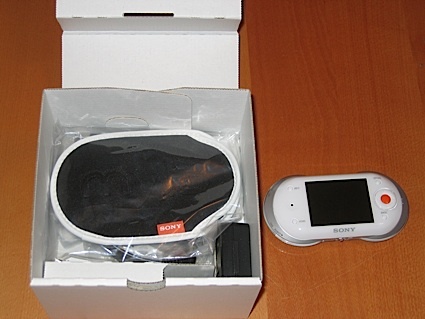 We wish Sony had done all the keys in white like the Symbol key. 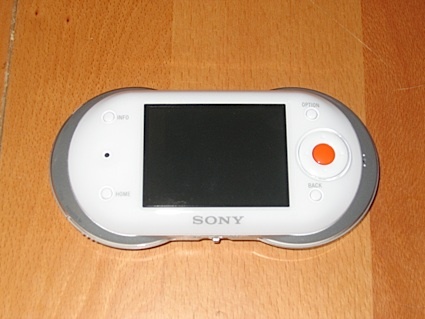 This also may be a good reason to go for the black unit instead of the Sony's "S2" aesthetics in this scheme. However, backlighting would solve all these problems. 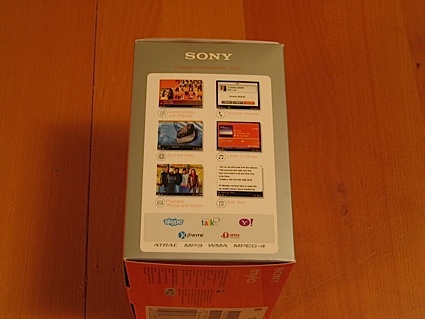 Here's a tour of the back, which feels platicky unlike the gloss smooth top exterior. 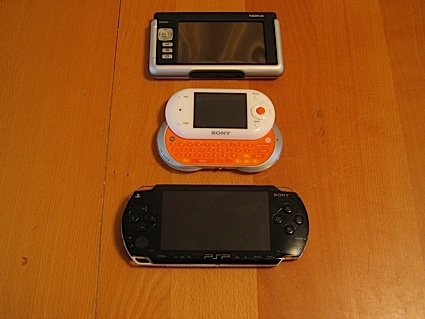 On the top left is the Memory Stick Duo slot and the bottom right has dedicated volume buttons and the hold switch. 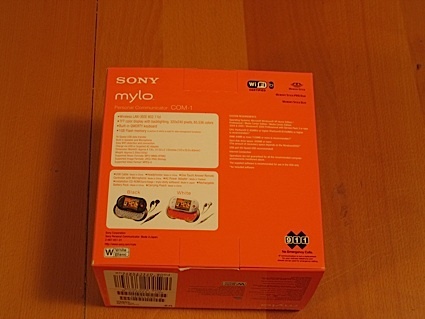 While the main speaker is easy to spot, power and WiFi slider switches (think PSP) are on the side of the Mylo. 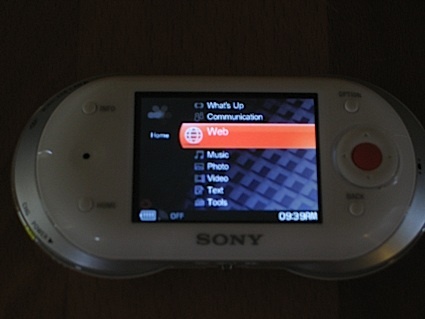 The control in the center on the bottom is for pausing skipping and replying. 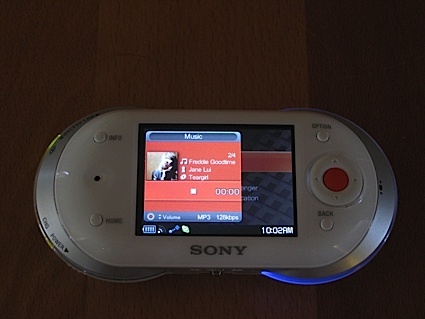 Flicking it instead of holding it down will skip ahead or back in a song or video. 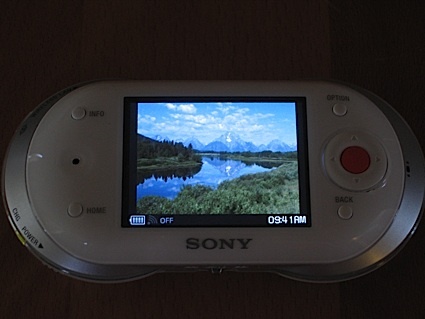 You can also use it to show a video in slow-mo. 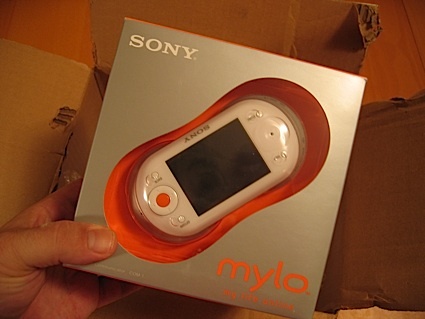 Mylo poses next to the PSP, which really doesn't look as much of an inspiration for its design after all when next to it, and the Nokia 770, which shares some of its features and lacks a physical keyboard but has a much larger screen. 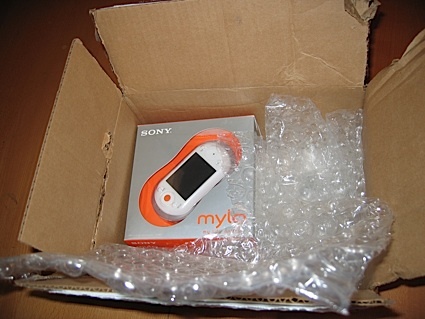 Mylo's not a traditional cellphone, but it's smaller than some smart phones and is closest in volume to a T-Mobile MDA. 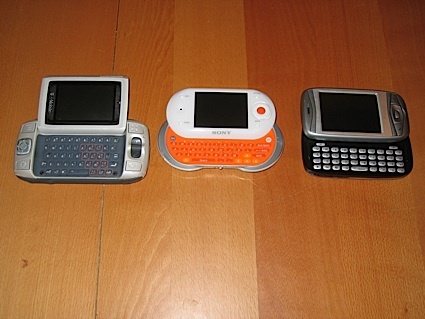 Mylo's keyboard feels like it has less key travel than phones with slide-out (or flip-out) keyboards. 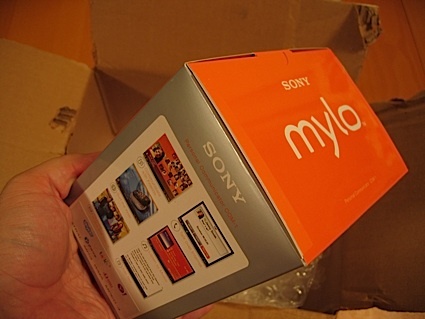 Mylo's on-screen interface is a departure from the XMB cross-media bar that Sony has looked to as an interface standard. 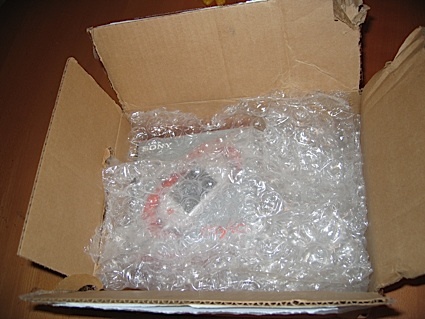 However, it's very simple to navigate. 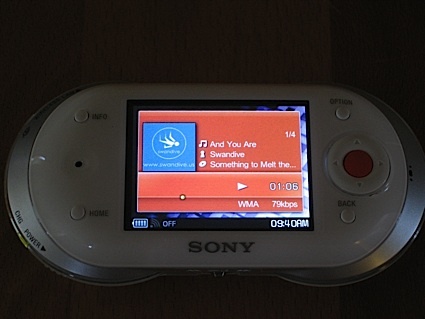 Here's a shot of the music-playing screen and a photo being displayed. 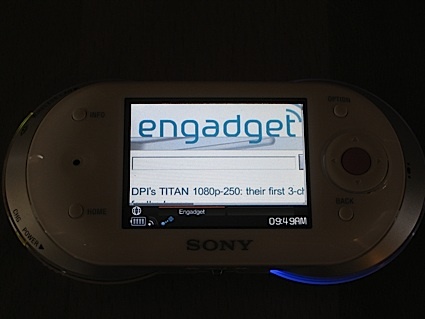 The Option button brings up menu items. 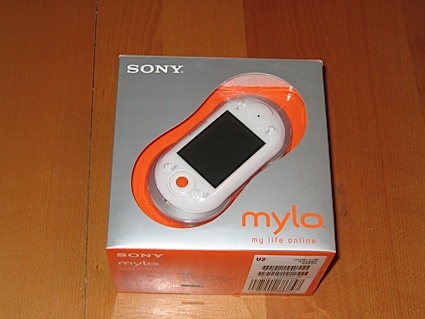 The Mylo's screen is nice and bright. You can switch between one-column view and full-page view where you'll do a lot of horizontal scrolling. 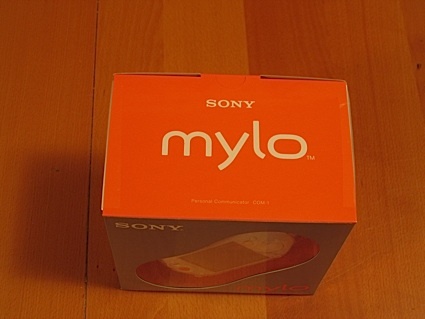 In a shot with it top slid up, we can see that the Mylo supports WPA and Web proxies. The keyboard slides up and down with a smooth satisfying thunk. 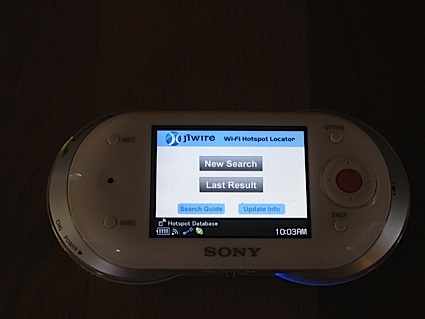 An included hot spot finder is a nice extra for finding out where the Mylo can go online, but alas Bluetooth has been passed over. Kirk to Enterprise, I've lost my rave light. 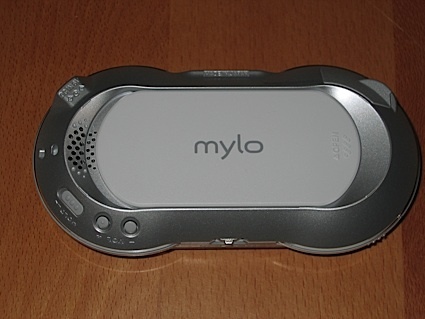 Can you please beam down a Mylo? 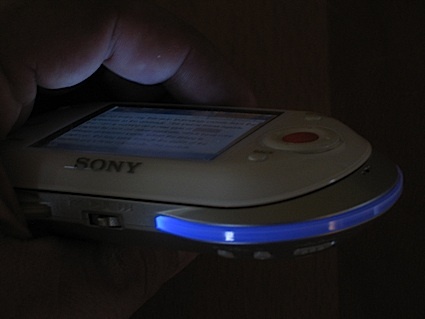 The purple-blue Wi-Fi light pulses when you're connected to a hotspot.